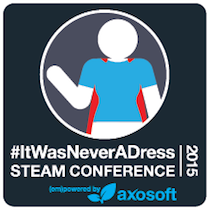 After launching the wildly successful #ItWasNeverADress campaign that touched women around the world, Scottsdale-based Axosoft wants to inspire the next generation of women to pursue the fields of science, technology, engineering, arts and mathematics (STEAM) through a conference that will offer girls 12 to 17 valuable tools to take on the tech world and the challenges that surround it. The girls will leave the conference with a business plan and resources to go back into their schools and start a STEAM-focused club or organization, and help infuse STEAM into the curriculum at their schools. As #ItWasNeverADress ambassadors, they also will receive the support of an advisory board comprised of influential community leaders who will contact them quarterly to offer guidance.